This easy hummus recipe is packed with an Asian-inspired flavor combination of ginger, garlic, lemon, coconut aminos (or soy sauce) and a touch of brown sugar. 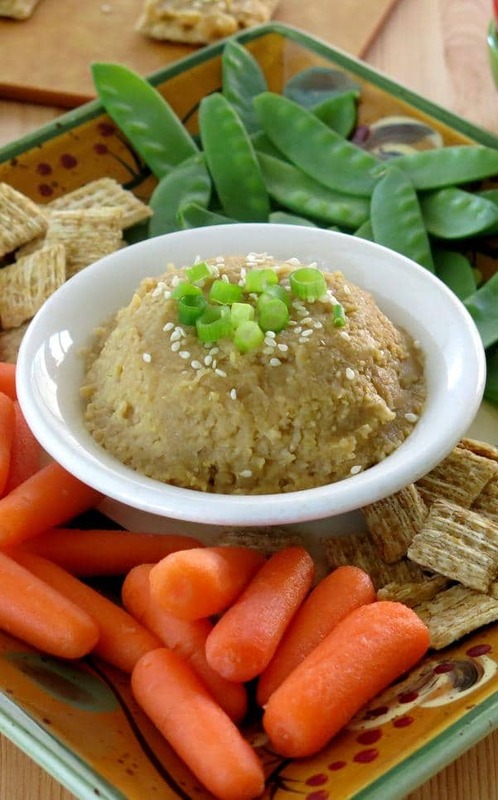 It takes just minutes to make this healthy and tasty dip. It was inspired after I posted the recipe for Sesame Beef Strips and Stir Fry Vegetables with a “finger-licking” good sauce. The flavor combination of garlic, ginger, coconut aminos (or soy sauce) and a titch of brown sugar is just addictive. I played around with the ingredient amounts, added a little lemon, mixed it up with a can of chick peas and came up with an easy hummus recipe that I’ve already made several times. Because we have a soy allergy in the house, I use coconut aminos instead of soy sauce and this seasoning really shines in this dip. I’ve successfully made the recipe with soy sauce. But, the flavor is more intense. 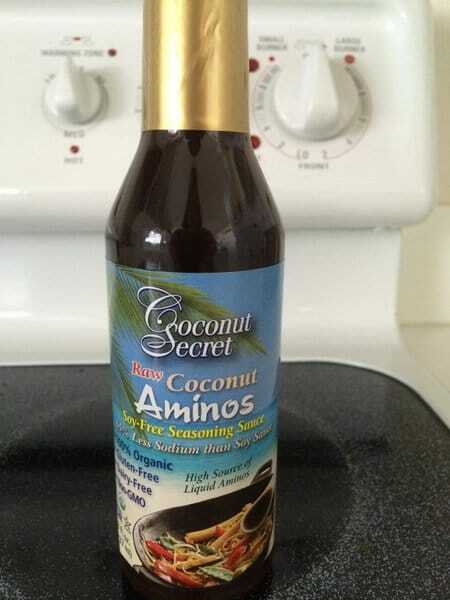 Whereas the coconut aminos flavoring is subtle and easily melds with the other flavors. 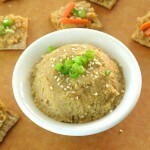 Speaking of ingredients, there is plenty of opportunity to adjust the taste of this hummus. I’ve doubled the amount of coconut aminos (not the soy sauce though.) And, I’ve used just 1 teaspoon of brown sugar….and an entire tablespoon. If you’re feeling experimental, start with a small amount of an ingredient, mix it up in the food processor, taste test, and adjust as necessary. 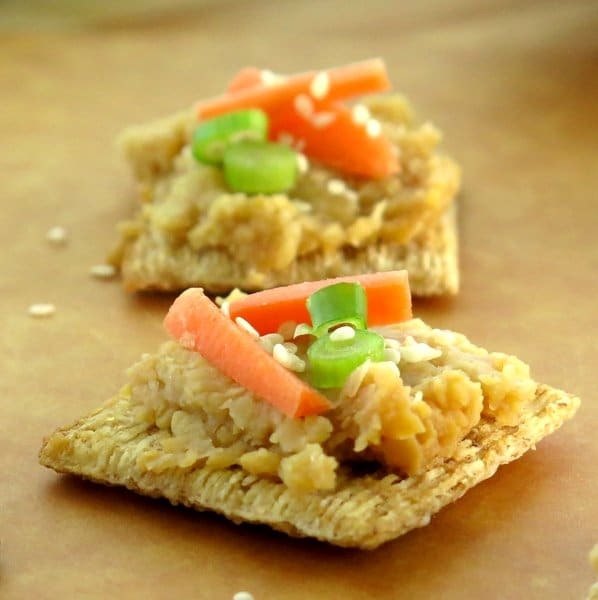 Pile the hummus on some crackers and top with garnish and you have a very pretty appetizer. Serve it with crudites for dipping and you have a very satisfying snack. Either way, it’s a tasty and healthy way to ring in the New Year! 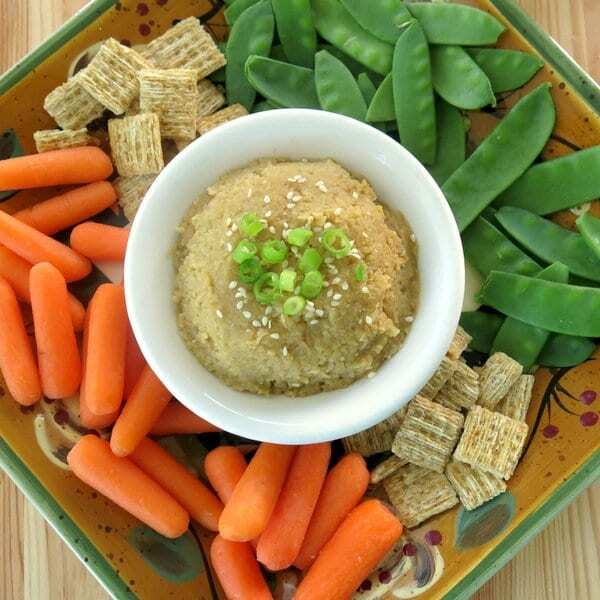 It takes minutes to make this easy hummus recipe packed with an Asian-inspired flavor combination of ginger, garlic, lemon and coconut aminos or soy sauce. Combine all of the ingredients in a food processor and pulse until finely chopped. Scrape down sides as necessary Mixture will be a little chunky but can be easily smoothed with a spoon. Substitute agave nectar for brown sugar (to taste, it doesn't take much and can be left out entirely for many people) and serve with snow peas, peppers or other appropriate vegetabes to keep recipe South Beach Diet Phae 1 compliant. 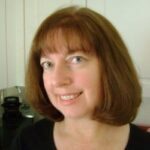 I am so glad you waited until after the holidays! It would have been a shame to miss out on something so delicious! Thanks Betsy! Happy New Year!